There are so many great places to visit in the world, and so little time in which to do it. From the Caribbean Islands to Canada’s shores, from Alaska to Hawaii and Mexico — nowadays a family cruise is a great option for families that love to travel but don’t need the hassle of booking flights and finding affordable hotels. You get to sightsee, relax, and enjoy the actual travelling rather than be exhausted by it and there are so many activities to keep the kids busy the biggest surprise for parents is when the cruise has finished the kids are reluctant to leave the ship. You’ll love being onboard as much as them. So pack your bathing costume and get ready for days of sun, fun and relaxation in between exploring the world’s best beaches, funnest cities and most enchanting sightseeing destinations. Disney is a child’s Mecca; everything it does is for children. 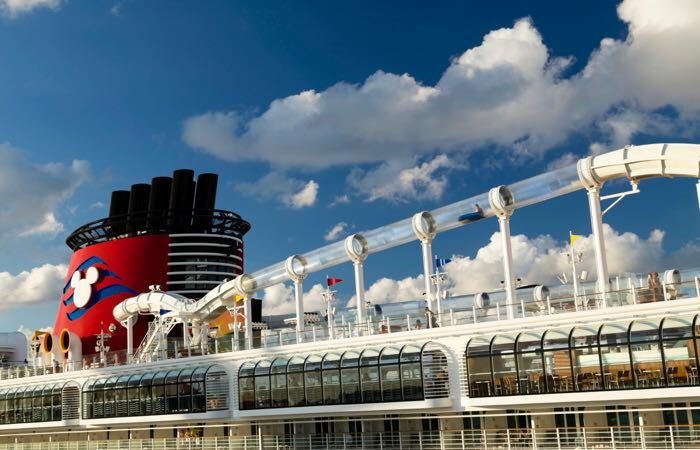 So it’s no surprise that Disney Cruise Lines has a number of activities and facilities dedicated to meet your children’s every entertainment need. The fun starts at 09h00 every morning and continues until midnight, so while your toddlers are safely tucked away in bed after a busy day, your teens still have something to do. Flounders Reef Nursery caters to children up to the age of 3. The Oceaneer Club is for children aged 3 to 7.Within the club children are divided into two age groups (3-4 and 5-7) each with age-appropriate activities. Activities include themed play, edutainment and computer games. Oceaneer Lab caters to children between the ages of 8 and 12. The lab also consists of two age groups: 8-9 and 10 -12. Activities focus on learning that is fun, and just plain fun, such as basic animation, creating TV spots, scavenger hunts and even “camping”. While there are also structured activities for teens, Disney knows that teenagers don’t like to be dictated to, so there are number of clubs which allow them to hang out, socialise and play games. Aloft is an activity centre exclusive for teens, activities include video games, internet and social opportunities. Edge is a tweens space for children aged 11 to 13. Vibe is an indoor lounge and sundeck where teens can do what they do best, hang out in the sun and watch TV and get to know the other kids on board. There are also a number of age-appropriate pools, live shows and port adventures to turn even the most ardent landlubber into a sea dog. This port-of-call paradise is reserved for Disney cruise guests. Only Disney Cruise Line Bahamain and Caribbean cruise vacations stop at this exclusive idyllic destination. Get out your goggles and go snorkelling, swimming and boating. Costa Cruises (a subsidiary of Carnival Corp) sails around the Caribbean and Europe and, like Disney, has a number of programmes to ensure that children have as good a time (perhaps even better) as their parents. There are four kids’ programmes that are divided into morning, afternoon and evening sessions. The Mini Clubs is for children aged 3 to 6. The Maxi Club is for children aged 7 to 10. The Junior Club caters to children aged 11 to 14. The Teens Club is for kids aged 15 to 19. Arts and crafts – t-shirt painting, jewellery making, preparing costumes for the themed kids’ evening and creating murals. Sports tournaments – volleyball, basketball, bowling, shuffleboard and water polo, as well as a video games tournament. Games – treasure hunt, dancing lessons, quizzes, talent show and pool games. Parties – fancy dress, pool party, pizza party and two themed dinners. Other kids’ facilities include Italian lessons, dance lessons, and a special kids menu at every meal. For an exotic experience that cannot be reached by land, the Norwegian Fjords and Highlands are not to be missed. Choose from a variety of destinations to explore such as Switzerland, the Netherlands, Spitzbergen and more. Carnival has a kids programme called Camp Carnival and caters to children between the ages of 2 and 15. Toddlers for ages 2 to 5. Activities include cartoons, cookie decorating, drawing, sing-alongs and a splash pool. Juniors for ages 6 to 8. Activities include a talent show, face painting, indoor fair and outdoor games. Intermediate for ages 9 to 12. Activities include t-shirt painting, photography, dance classes, a video tournament and volleyball. Teens for ages 13 to 15. Activities include pool party, indoor beach party, pizza party and a skin care and hair dressing demonstration. Other facilities include a special kids’ menu and a 114 foot long, 15 foot high water slide. Take a chance and plunge bow-first into Bermuda, who knows if you’ll ever return. You’ll be delighted in exploring King’s Wharf, a green-hilled island discovered over 500 years ago. Royal Caribbean has a kids programme called Adventure Ocean. Royal Babies and Royal Tots for ages 0 to 3. Aquanauts for ages 3 to 5. Explorers for ages 6 to 8. Voyagers for ages 9 to 11. Other facilities include rock climbing, a surf simulator, ice-skating rinks and Broadway-style shows. This expertly put together cruise allows you to visit more than one destination with highlights like exploring the Mayan pyramids of Cozumel and taking in the distinctive architecture of Barcelona. Holland has a kid programme called Club Hal for children aged 3 to 17. As with all the other cruise lines, the programme is divided into different age groups. Kids for children aged 3 to 7. Activities include fabric painting, treasure hunts, puzzles and drawing contests. Tweens for kids aged 8 to 12. Activities include on-deck sports, golf putting and disco and themed parties. The Loft and The Oasis for teens aged 13 to17. Activities include karaoke, video games, sports tournaments, trivia contests and movies. Other facilities include kid-friendly menus, port day activities and after hours programmes. One of the great achievements of the 20th Century is the Panama Canal. Travel along this engineering masterpiece and learn about the people who dedicated their lives to the Canal on the cruise ships Explorations program. Beyond the channel you’ll find their award-winning private island Half Moon Cay. Your family vacation is ready and waiting onboard kid-friendly cruise ships. Don’t worry about having to keep your little ones occupied while trying to sneak in a few hours of laying in the sun, with the cruise ship programs for children you and your family are ensured an amazing trip. What is the best cruise line for kids? Disney is nearly everyone’s favorite – whether you ask kids or parents. The pools, slides, theaters, perks, amenities, kids’ clubs, and fun themes put it above every other cruise line. Great disney-owned destinations add to the appeal. What’s the best cruise length for families? Generally one week. Shorter cruises (3 or 4 days) attract more partyers looking to pack lots into a short break. Longer cruises (more than 10 days) attract older travelers that have the time and money for a longer cruise. What cruise lines have the biggest cabins for families? Disney has the biggest – most family-friendly – cabins. A majority of Disney’s cabins have 2 bathrooms, bathtub, and mini-fridge. Compare Disney cabins here. How big are the cabins onboard and Should we book a cabin or a suite? Even on Disney cabins are small and families will feel confined if they’re spending much time in there cabin at all. Suites and Junior suites are recommend (especially if you have kids older than 8 or 9) and are mandatory if you have more than 2 children accompanying you. Is babysitting available on a cruise? Yes. Disney, Carnival, and Royal Caribbean offer group babysitting (ages 3 to 12) and nurseries (6 months to 3 years). Disney watches kids as young as 3 months. It costs about $4 to $8 per hour and can last until as late as 3am. The higher end cruise lines also offer in-cabin babysitting for about $10/hour. Are cribs available on family cruises? On most yes, and certainly on Disney and Royal Caribbean. But be sure to request one when you book and phone ahead (or email) to confirm – ships only carry a limited number of cribs and pack-n-plays so be sure one has your name on it. Are baby food and diapers available on-board? On some ships, yes. But if your child is picky or has specific dietary needs then be sure to pack what they’ll need. Disney is the best in this regard and will deliver pre-ordered goods (formula, diapers, baby food) directly to your cabin. What type of accessories and baby equipment are available on-board? Some lines have strollers, diaper genies, pack-n-plays, and the works. Enquire before sailing and reserve what you’ll require. Do cruises have kids programs and what do I need to know about them? Most major non-luxury lines and large ships will have some form of children’s program. The top family-friendly ships have elaborate playgroups and kids’ programs. Is there a minimum age for kids and babies to take a cruise? Yes, but it varies by cruise line, ship, and even itinerary. For Disney cruises it’s 12 weeks. For Carnival, Celebrity, and Royal Caribbean it’s 6 months. For Cunard, Princess, and other luxury cruises it can be as high as 12 months. Disney and Royal Caribbean have the best on-board facilities for young babies. Many of their ships have full service nurseries with fun themes and tons of toys. What cruise line has the best gym, fitness, and sport facilities? Royal Caribbean has the best facilities for staying active and the widest array of activities. All ships have rock climbing walls, well-equipped gyms, yoga classes, and spas. The Voyager, Freedom, and Oasis class ships also have ice skating, basketball, volleyball, and miniature golf. The Freedom and Oasis have Pilates studios and a full size boxing ring. The Oasis class also have a zip line, aqua theater, surfing simulator, and 1/2 mile onboard running track. How do I find cheap hotels near the cruise port? Hotelscombined.com is a great site for finding hotel deals and has a huge selection for nearly all port cities. after going on a disney cruise, how can carnival even be listed, the kids did not want to leave the oceaneers club on disney, whereas carnival’s kids club was a PUNISHMENT for misbehavior. the people were unfriendly, the activites boring, and the kids refused to go after the 2nd day. it was the worst possible cruise experience for the entire family, cheesy activities, horrible food, trashy passengers, crummy rooms. Really, had i not gone on the disney cruise first, i would have sworn off cruises altogether. Disney was so enjoyable for the kids that my husband and i actually had time to ourselves! The great thing about cruising is that there is a cruise line to suit just about everybody’s preferences. Our first family cruise was on Disney (Caribbean) and we have since cruised Princess twice (Alaska and Baltics), Holland America (Caribbean) and Celebrity (Mediterranean). While my kids had a great time on the Disney cruise, neither of them have any desire to do it again. If you asked them to rate the four cruiselines that they have been on in order of preference then they would tell you Princess, Celebrity, Holland America and Disney. Nearly all mainstream lines are now actively soliciting family passengers so it’s possible to pick whichever one you think suits your family’s travel style and not feel confined to the ships that have traditionally been considered “family-friendly”. The Princess kids clubs are great. Divided by age group which not all cruise lines do. They have babysitting too, which comes in handy. They’re more focused on the Pacific (Hawaii, Mexico, and California) and not so much from the Caribbean where Disney is probably the best choice (at least that’s what my sister in Miami says.) We live in L.A. If you live in a port city book last minute and get great deals. Agree that Disney is the best overall but I would read reviews on individual ships, their restaurants, swimming pools, kids clubs, and (of course) where they’re going to stop. Each ship seams to grow on its reputation and attract people with those interests and priorities, so user reviews really do add some input in the long run even if they might be sort of narrow and specific in each review. We’ve done several cruises with kids and would rate Disney as the best. It has the best kids programs, the nicest and biggest swimming pools, and the best family food – and by good food a mean decent quality food that the parents can enjoy too. The Castaway Cay stopover is really fun. Norwegian Cruises has the most relaxed vibe and feels the least like a typical cruise. Carnival is the cheapest option. The food is terrible. The rooms are small. But the staff is quite friendly. Tip: check for added fees for each cruise as these can add up. Also consider the flight costs from your home city for any plans. Hi! Let me just congratulate you for your blog! it is really helpful for big families. I first thought that the only destination that would be interesting for a child would be Disneyland, but I discovered many more destinations with the help from many friends and blogs, of course. I took my family to Uruguay on January, which is summer in South América. We had a great time. Let me say that tourism is one of the most important activities in Uruguay, and they are taking great advantage of it. Have you ever been to Uruguay? I highly recommend it, either for families, couples or by yourself. Cheers!